Power Manager 4.0.3 and Power Manager Professional 4.0.3 are now available. These updates include a few bug fixes and improvements. Bug: Fixed inactivity trigger bug that could cause triggers to be delayed or not fire. API: Added throughput methods for tallying bytes sent and received over a network connection. API: Added Power object for observing and working with power sources. API: Added trigger power state for triggering when a power source switches between mains and battery. API: Added trigger power remaining for triggering when a power source capacity or remaining seconds changes. API: Added trigger battery health for triggering when the health of a power source changes. API: Added condition power state to test for a specific power state. API: Added condition power remaining to test for power source current capacity or remaining seconds. API: Added condition battery health to test for power source health. Refined: Improved recovery behaviour if a self-signed certificate can not be created. Refined: Improved inactivity trigger to better synchronise overlapping triggers. Version 4.0.3 is free for users of Power Manager 4. 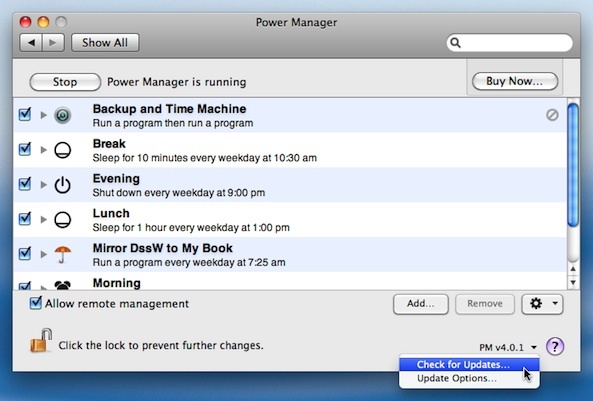 Existing users can update using Power Manager’s automatic software update. This article was posted in Business, PM4, PMPRO4, and Power Manager and tagged Power Manager, Power Manager Professional, and release.